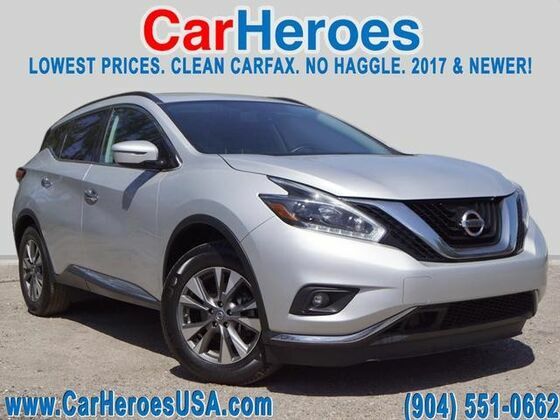 CarHeroes is pleased to be currently offering this 2018 Nissan Murano SV with 34,360mi. This Nissan includes: GRAPHITE, CLOTH SEAT TRIM BRILLIANT SILVER METALLIC *Note - For third party subscriptions or services, please contact the dealer for more information. * This vehicle is loaded with great features, plus it comes with the CARFAX BuyBack Guarantee. Treat yourself to an SUV that surrounds you with all the comfort and conveniences of a luxury sedan. The look is unmistakably Nissan, the smooth contours and cutting-edge technology of this Nissan Murano SV will definitely turn heads.